The crackdown in Bahrain shows no sign of relenting. More than 800 people have been detained and four have already died in police custody. Formula 1 auto racing is one of the most-watched sporting events in the world, with over half a billion viewers last year. This year's spring season was set to open with the Bahrain Grand Prix, but the crackdown caused F1 to postpone its 2011 race. F1 needs to send the right message to the Bahraini regime—that the world does not stand with repressive governments. 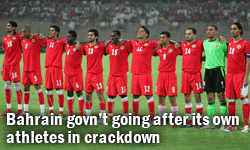 Authorities will decide tomorrow, June 3, whether to grant Bahrain a delayed 2011 race. Continuing attacks on peaceful protesters show Bahrain is incapable of hosting a major international sporting event and should not be rewarded for abusing human rights. Granting the Grand Prix to a repressive regime will disappoint F1 fans everywhere. It should not turn a blind eye to torture, disappearances, and deaths of peaceful protesters. Sign the petition and send a message to CEO Bernie Ecclestone. Tell him to set Formula 1 on the right track by canceling the Bahrain Grand Prix.